The Centre has eleven meeting rooms which are available for conferences and meetings during University vacations. Which include a “Harvard Style” lecture theatre for 90 and a boardroom for 30. There is also a Cafe and Restaurant within the Centre. 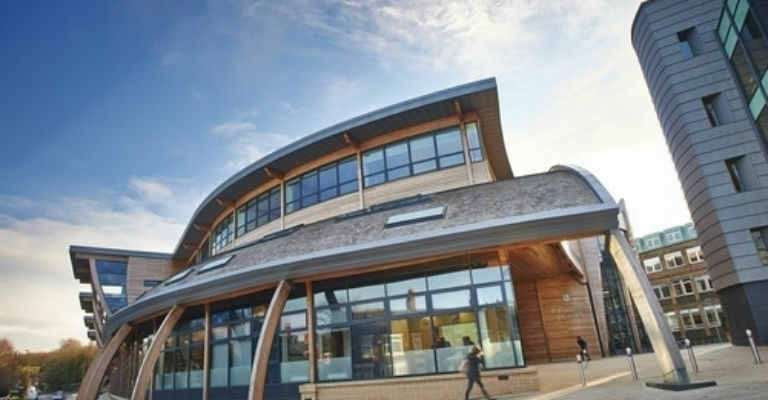 Designed with sustainability in mind, materials such as solar thermal collectors, photovoltaic panels, air source heat pumps, solar shading, rainwater harvesting and sedum roofing are used in the building. The integration of these elements has already been recognised with an ‘excellent’ rating on the Building Research Establishment’s Environmental Assessment Method (BREEAM). Artwork also forms an important part of the Palatine Centre with a brand new art collection housed in the building. As with all central teaching and meeting rooms, those in the Palatine Centre can be booked in conjunction with bedrooms at one of our nearby colleges, only a few minutes walk away, so that this then becomes the ideal venue for any prominent residential conference.